The Moa River at its rainy season high. 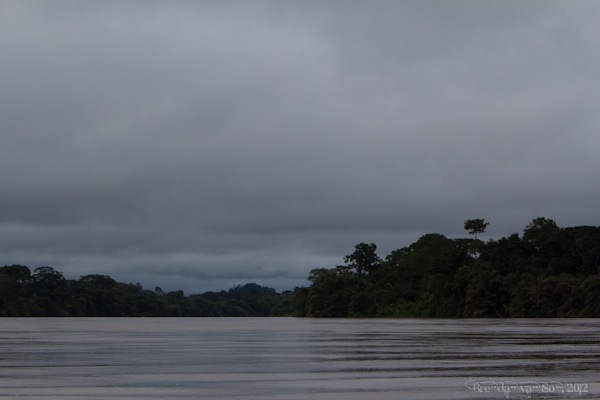 The gentle churn of the engine putters as we cross the high waters of Sierra Leone‘s Moa River. In our sights is a playground to as many as eleven different species of primates, and a host of other wildlife such as pygmy hippos, duikers and wild hogs. As we approach the green banks of the island the boat is completely silent. Attempting to push aside the sound of the churning engine our ears are all pointed towards the forest. 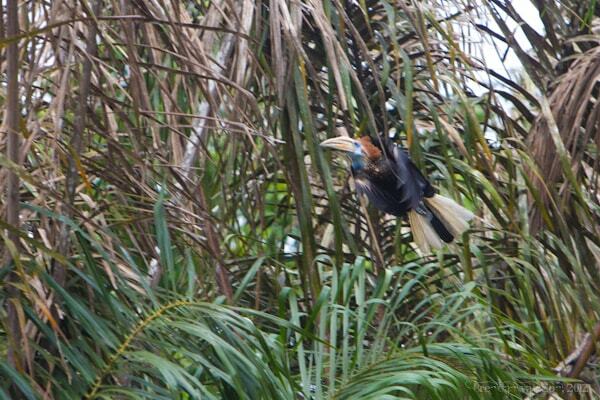 A hornbill calls out to a mate before the sound of his powerful flight dominates the airwaves. Then, the sound of crashing is heard through the foliage. Through the thick brush which hangs over the water, the silhouette of a large primate is clearly drawn out. I race for my camera gear which has all been packed away. I had no idea we’d have the chance to spot something this quickly; we haven’t even arrived at the island yet. I fumble as my heart races; the sport of wildlife photography has taken hold. Unfortunately, as I finally twist on my lens into place and rest my eye on the lip of the viewfinder, I watch as the chimp takes off through the thick bush and far from our gaze. 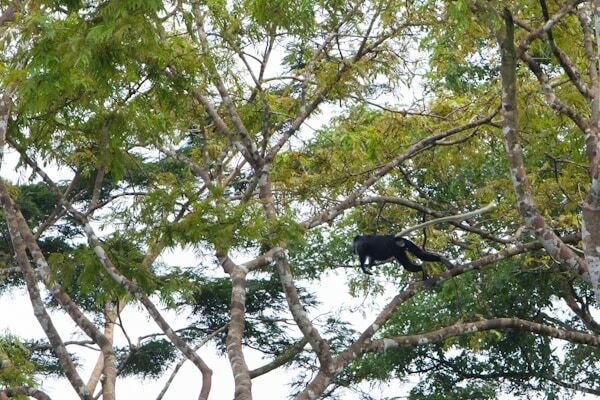 Primates are too fast… Here, a Campbell’s Monkey dives from one branch to another. I’ve arrived on Tiwai Island after a long day’s journey from Freetown and the sun is already about to set and causes a dome of yellow glowing light as it does. As the dark takes over, I wonder to myself if the jungle really becomes louder at night or if it is only heightened by our loss of the sense of sight. The calls of monkeys, birds, and even chimps in the distance rings out as the clock turns slowly towards another day. With the grass still wet from a night shower and the light still diving through the jungle like a beam, I follow in the footsteps of the small rubber boots of a local guide. 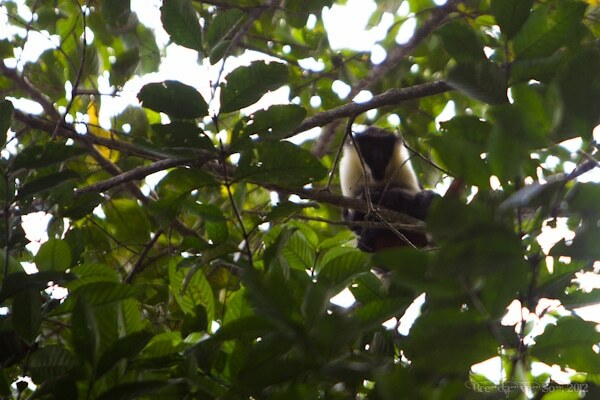 Within mere minutes we’ve spotted a troop of Red Colobus monkeys in the trees, a sooty mangabey racing across the path and a couple spot-nosed monkeys that are too quick to be photographed. 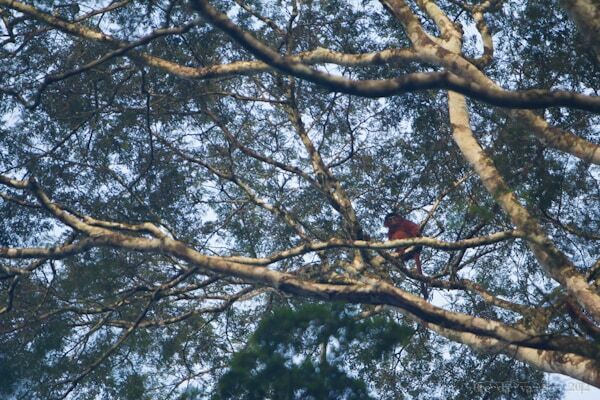 A red colobus monkey off in the distance. We wander alertly through the forest floor following a trail covered in discarded fruit, fallen leaves and tracks of animals big and small. In the bush, the frightened and horrifying yell of a Red River Hog screams at us to keep our distance. “Is it dangerous?” I ask the guide who looks back with a smirk. “Only if it has young ones with it,” he says as his smirk turns to an all-out smile. “Let’s see if we can get closer”. We don’t get 5 steps deeper into the forest before a distraction comes in the form of a powerful rustling in the forest behind us. “Another hog?” I question not knowing which way to set my eyes or my camera lens. We step cautiously down the path, causing a crinkling sound with each step. Only humans could ever walk with such little grace in the forest. We give away our presence long before getting anywhere near anything at all. As we approach the spot where we heard the sound we see tracks in the mud, a slight trail of destruction and then an entry point to the water. 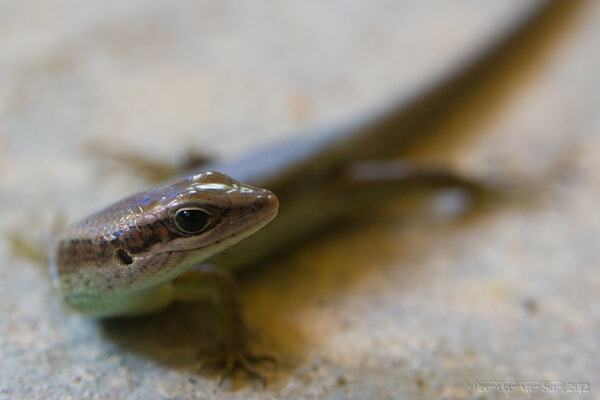 Not a Hippo… but a curious lizard is still cool! The escape of the hippo is only a disappointment until the activity of the forest again allows me to forget the animal I almost saw. In the trees a Campbell’s monkey plays, off in the distance a beautiful Diana monkey echos her call, and the hornbill – perhaps the sign of this island – flaps his thunderous wings. At each turn on Tiwai Island there is a new species and a new wondrous creature. In my 3 days on Tiwai Island I managed to spot 9 of the 11 primates on the island (one of the two I didn’t see is nocturnal). And despite the fact that I hardly got a single usable photo of primates on the island, I left the Tiwai on an absolute high. Tiwai Island is a primate’s paradise. It is one of those special places where we are truly guest of their world, and even just small glimpse into their playground is such a rewarding experience. Tiwai Island, like so many places I’ve visited in this great country, is another great example of the tourism potential of Sierra Leone. However, as much as I would love to see tourism boom in the country, I can only hope it is done in a way that makes sure we remain guests in their paradise rather than destructive intruders.